Cucumbers ripen before your eyes. In the morning they are smallish and pickling size, if you turn your back, they become large fellows fit for soup: too big for raita, a little dry for munching. 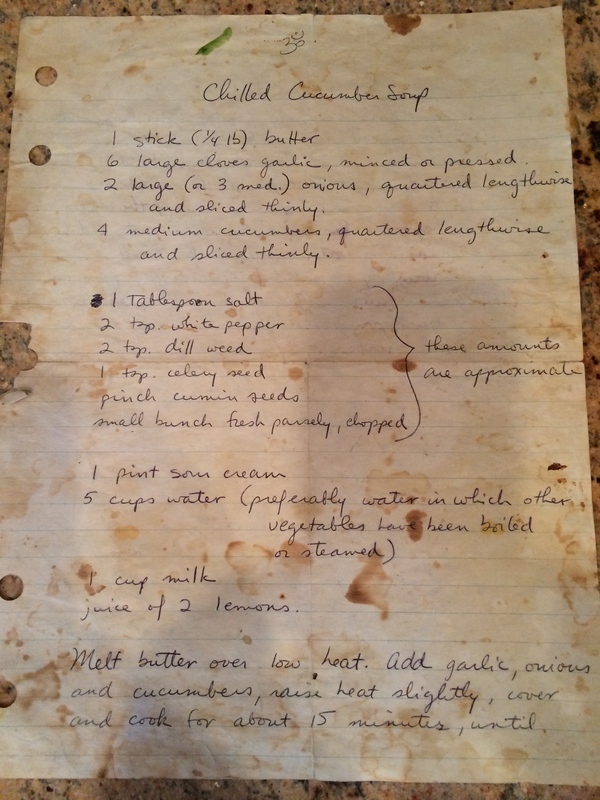 I found this recipe from my days at an ashram. A woman named Pat was the excellent cook in the bunch. Quiet and thoughtful, she wrote out her chilled cucumber soup recipe for me, which is now covered with stains, some close encounters with the gas stove, and, after almost forty years, age spots that plague us all. 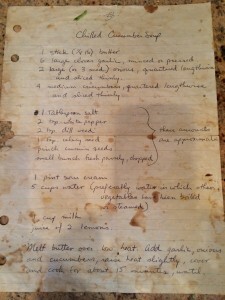 We lost touch many years ago but on an annual basis, I say hello, via this recipe. It’s rich and delicious. Easy on the white pepper. Hi Pat! 1T salt, 2 tsp white pepper, 2 tsp dried dill, 1 tsp celery seeds, pinch cumin (I like more) small bunch fresh parsley, chopped. Melt butter over low heat. Add garlic, onions and cucumbers, raise heat slightly, cover and cook for about 15 minutes, until cucumbers are tender. Stir frequently. Add spices and cook about 3 more minutes. Remove from heat. Blend about 2 cups of mixture with sour cream and 1 cup of broth/water. Return to pot. Add remaining broth and milk. Chill thoroughly. Just before serving, stir in lemon juice. Garnish with lemon slices or fresh parsley. Serves 8 as a first course.